Necessity is the mother of invention. From big sophisticated machines to small articles like knives and pencils, every single thing was invented out of necessity. At Magic Opener, the professional technicians are manufacturing extremely useful and premium quality can and bottle opening tools. We are offering our standard products at the best prices so that everyone can purchase it to simplify opening any kind of can or bottle. Human brain and human requirement has no limit. In this highly advanced world, life has become very comfortable and easy with the incredible creations of wise and talented men. There are myriad of tools in the market that are helping us to accomplish every work without much effort. Tools such as bottle openers seem to be simple things in appearance, but they are not at all simple if we consider their performances. 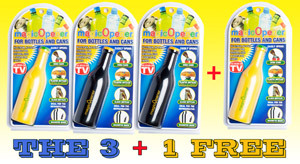 Opening a bottle top is easy with the specially designed tools of Magic Opener, but without one it will be difficult. Perhaps, the products are proving very helpful to people who are suffering from several health related problems or physical weakness due to growing age. With the help of the tools they are able to overcome their frustration of daily activities. This small equipment is useful in various ways. If you are a frequent beer or aerated drinks drinker, you have high chance to misplace an opener sometime or the other. Considering your frequent needs, our bottle openers are all equipped with a magnetic back so that you can store it in an easily accessible place; stick it on refrigerator, bike frame, boat railing or any metal surface where the magnetic back can stick properly, this way you will never loose the tool. The products available at Magic Opener are perfect to carry while camping or traveling, for the office or beach party, in your car or van and many places. It can open water bottles, juice cans, aerated cold drink bottles and many more. So, purchase the multi-purpose bottle opener that can make your life more convenient. With its multi tasking ability you might like to have one handy tool everywhere you go. Along with numerous functions, our bottle openers are ergonomically designed to make every opening task gentle on your hands and easy to accomplish. The well designed products are the best for people with limited hand strength or for those suffering from Arthritis. The customer satisfying tools of Magic Opener have made handling everyday house whole chore manageable and easier for every person of different age group. The durable and helpful products come with lifetime warranty. Never think that you are weak or helpless when it comes to the question of opening bottles and cans, the special Magic openers are always there for you to make the task easier than you imagine. These openers are now accessible for all the people at the most competitive prices ever.